If you have seen squirrels hanging out on your roof chances are that they have made your attic their home. Grey Squirrels are know to build nest in your attic and destroy your homes wiring. We have seen wiring in homes totally stripped of the insulation. We offer grey squirrel trapping with specialized equipment designed for squirrels. We also over professional exclusion work with high quality materials that will prevent re-entry. If your yard is over run with squirrels and they are eating your fruit trees before you can harvest them we can trap and relocate the squirrels to lower the population. Squirrels are in the rodent family and must chew constantly to keep their teeth from growing preventing them from being able to eating. This chewing causes damage to the inside of your attic. We have seen where they chew the insulation from electrical wires leading to fire hazards. We offer all inclusive trapping methods to rid your attic of squirrels. The flying squirrel is one of the very common nuisance animals in our area. In this chapter tree squirrels are divided into three groups: large tree squirrels, pine squirrels, and flying squirrels. Large tree squirrels include fox (Sciurus niger), eastern grey(Sciurus carolinensis), western gray (Sciurus griseus), and tassel-eared (Sciurus aberti) squirrels. Fox squirrels measure 18 to 27 inches (46 to 69 cm) from nose to tip of tail. They weigh about 1 3/4 pounds (787 g) to 2 1/4 pounds (1,012 g). Color varies greatly, from all black in Florida to silver-gray with a white belly in Maryland. Georgia fox squirrels usually have a black face. Ohio and Michigan fox squirrels are grizzled gray-brown above with an orange underside. Sometimes several color variations occur in a single population. Eastern gray squirrels are also variable in color. Some have a distinct reddish cast to their gray coat. Black ones are common in some northern parts of their range. 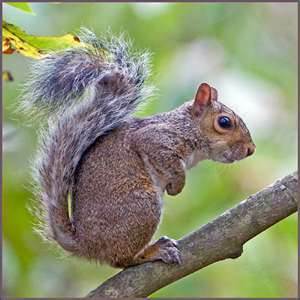 Eastern gray squirrels measure 16 to 20 inches (41 to 51 cm). They weigh from 1 1/4 pounds (567 g) to 1 3/4 pounds (794 g). The western gray squirrel is gray above with sharply distinct white under parts. Size is similar to that of the eastern gray squirrel. Tassel-eared squirrels are similar in size to gray squirrels and have several color phases. The most common is gray above with a broad reddish band down the back. Black tufted ears are their most distinguishing characteristic (the tufts are larger in winter, about 1 inch [2.5 cm]). There are two species of pine squirrels: the red squirrel (Tamiasciurus hudsonicus) and Douglas pine squirrel (Tamiasciurus douglasii). Pine squirrels are 10 to 15 inches (25 to 38 cm) in total length and weigh 1/3 to 2/3 pounds (151 to 303 g). Red squirrels are red-brown above with white under parts. Douglas squirrels are gray-brown above with yellowish under parts. Both species have small ear tufts and often have a black stripe separating the dark upper color from the light belly. 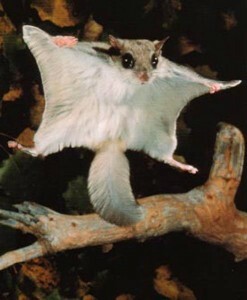 Two species of flying squirrels occur in North America. The southern flying squirrel (Glaucomys volans) is 8 to 10inches (20 to 25 cm) long. The northern flying squirrel (Glaucomys sabrinus) averages 2 inches (5 cm) longer. It can be difficult to distinguish between the two; both may be various shades of gray or brown above and lighter below. A sharp line of demarcation separates the darker upper color from the lighter belly. The most distinctive characteristics of flying squirrels are the broad webs of skin connecting the fore and hind legs at the wrists, and the distinctly flattened tail. Fox squirrels occur in much of the eastern and central United States, as well as in several locations in the West, where they have been introduced Eastern gray squirrels have a similar range to that of fox squirrels but do not occur in many western areas of the fox squirrel’s range. They have been introduced in several locations in the West. Western gray squirrels are confined to west coast states and a small portion of western Nevada. Pine squirrels occur across northern North America south into the Appalachians and Rockies, and on the west coast. Red squirrels are often associated with coniferous forests. The Douglas squirrel is restricted to the west coast from southwestern British Columbia south through the Sierras to northern Baja California. The tassel-eared squirrel is restricted to Ponderosa pine forests in the Southwest, usually at altitudes above 5,000 feet (1,500 m). It occurs in portions of Wyoming, Colorado, New Mexico, Arizona, and Utah (Fig. 2). The northern flying squirrel occurs across northern North America. Its range extends south into the Appalachians and Rockies. The southern flying squirrel occurs in the central and eastern United States. 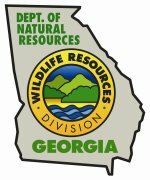 This is the most common of all the squirrel species in the west-central Georgia area. Fox squirrels and gray squirrels inhabit the same kinds of forests, both hardwood and coniferous, over much of their range. Gray squirrels are more abundant where a high percentage of land is forested. In areas with 10% forest cover, fox and gray squirrel populations may be equal. Fox squirrels prefer oak-hickory habitat over much of their range, especially in the West. In Georgia and Florida, fox squirrels seem to prefer pine timber. The western gray squirrel prefers mixed hardwoods and conifers and dry open hardwoods. Tassel-eared squirrels are strongly associated with Ponderosa pine. Pine squirrels prefer coniferous forests but also occur in mixed conifer and hardwood forests, or sometimes in hardwood habitats. Fox and gray squirrels have similar food habits. 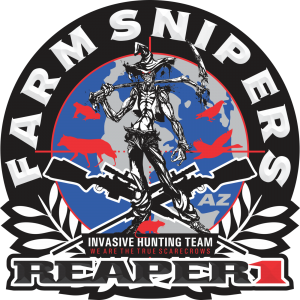 They will eat a great variety of native foods and adapt quickly to unusual food sources. Typically, they feed on mast (wild tree fruits and nuts) in fall and early winter. Acorns, hickory nuts, walnuts, and Osage orange fruits are favorite fall foods. Nuts are often cached for later use. In late winter and early spring they prefer tree buds. In summer they eat fruits, berries, and succulent plant materials. Fungi, corn, and cultivated fruits are taken when available. During population peaks, when food is scarce, these squirrels may chew bark from a variety of trees. They will also eat insects and other animal matter. 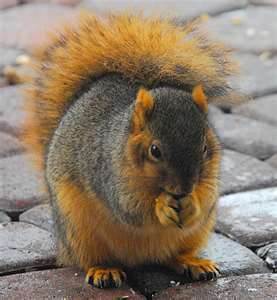 Pine squirrels are often heavily dependent on coniferous forests for cones and buds but will also eat a variety of other foods common to gray and fox squirrel diets. Douglas squirrels depend largely on Ponderosa pine for food. Flying squirrels’ food habits are generally similar to those of other squirrels. However, they are the most carnivorous of all tree squirrels. They eat bird eggs and nestlings, insects, and other animal matter when available. Flying squirrels often occupy bird houses, especially bluebird houses. Fox and gray squirrels breed when they are 1-year-old. They breed in mid-December or early January and again in June. Young squirrels may breed only once in their first year. The gestation period is 42 to 45 days. During the breeding season, noisy mating chases take place when one or more males pursue a female through the trees. They nest in tree cavities, human made squirrel boxes, or in leaf nests. Leaf nests are constructed with a frame of sticks filled with dry leaves and lined with leaves, strips of bark, corn husks, or other materials. Survival of young in cavities is higher than in leaf nests. Cavities are the preferred nest sites. About 3 young comprise a litter. At birth they are hairless, blind, and their ears are closed. Newborns weigh about 1/2 ounce (14 g) at birth and 3 to 4 ounces (84 to 112 g) at 5 weeks. Young begin to explore outside the nest about the time they are weaned at 10 to 12 weeks. At weaning they are about half of their adult weight. Home range size depends on the season and availability of food. It may vary from 1 to 100 acres (0.4 to 40 ha). Squirrels move within their range according to availability of food. They often seek mast-bearing forests in fall and favor tender buds in elm and maple forests in the spring. During fall, squirrels may travel 50 miles (80 km) or more in search of better habitat. Squirrel populations periodically rise and fall. During periods of high populations, squirrels—especially gray squirrels—may go on mass emigrations. At such times many animals die. Fox and gray squirrels are vulnerable to numerous parasites and diseases. Ticks, mange mites, fleas, and internal parasites are common. Squirrel hunters often notice bot fly larvae (called “wolves” or “warbles”) protruding from the skin. These fly larvae do not impair the quality of the meat for eating. Squirrels are a food source for hawks, owls, snakes, and several mammalian predators. Predation seems to have little effect on squirrel populations. Typically about half the squirrels in a population die each year. In the wild, squirrels over 4 years old are rare, while in captivity individuals may live 10 years or more. The biology of other North American squirrels has much in common with that of fox and gray squirrels, although most other species have one breeding season per year. Flying squirrels are unique in that they are active at night. All other species are active during the day. Squirrels may occasionally damage forest trees by chewing bark from branches and trunks. Pine squirrels damage Ponderosa pine, jack pine, and paper birch. In the Southeast, fox squirrels damage loblolly and other pines. These species and others may eat cones and nip twigs to the extent that they interfere with natural re-seeding of important forest trees. This is a particular problem in Ponderosa pine forests where pine squirrels may remove 60% to 80% of the cones in poor to fair seed years. In forest seed orchards, such squirrel damage interferes with commercial seed production. In nut orchards, squirrels can severely curtail production by eating nuts prematurely and by carrying off mature nuts. In New England fruit orchards, pine squirrels may eat ovaries of cherry blossoms and destroy ripe pears. Pine, gray, and fox squirrels may chew bark of various orchard trees. In residential areas, squirrels sometimes travel power lines and short out transformers. They gnaw on wires, enter buildings, and build nests in attics. They frequently chew holes through pipelines used in maple syrup production. Squirrels occasionally damage lawns by burying or searching for and digging up nuts. They will chew bark and clip twigs on ornamental trees or shrubbery planted in yards. Often squirrels take food at feeders intended for birds. Sometimes they chew to enlarge openings of bird houses and then enter to eat nestling songbirds. Flying squirrels are small enough to enter most bird houses and are especially likely to eat nesting birds. In gardens, squirrels may eat planted seeds, mature fruits, or grains such as corn.